We are excited to share with you our workshops for September 2016. We pride ourselves on the quality of our workshops and the expert tuition. We provide copious amounts of tea,coffee and biscuits all day and a warm welcome in either Busy Bees Shop or in the Community Centre just across from the shop. This will be a fun and stimulating day. 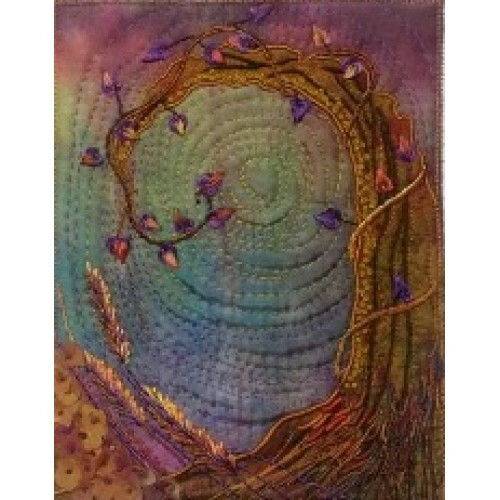 Sandra will help you create interesting surfaces from paper and print which can then be embellished with stitch,buttons and trims. 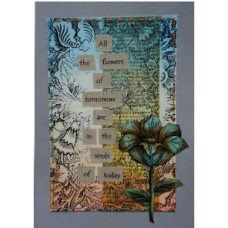 Create individual pieces of textile art to embellish cards,scrapbooks and lables. Following the success of last year's class, Ann has agreed to run this workshop again. 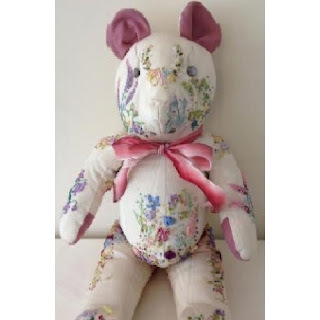 Ann will teach you all the silk ribbon stitches to make this bear and some basic embroidery stitches to make this beautiful heirloom bear. 6 session class held fortnightly starting on Thursday 15th September and ending Thursday 24th November 2016. from 1pm - 3pm. Lisa will be teaching you how to create this fun memory making height chart. Instead of marking the bedroom door as the children grow taller, now you can do it style. A fun mix of patchwork and applique which Lisa's expert tuition will help you achieve with both hand and machine stitching. 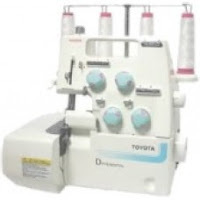 Have you a lonely overlocker banished to the attic or under the stairs, well now is as good as time as any to get it out and book on this class. Beccy has a vast knowledge of these machines and will show you that it is not as scary as you think and you will be soon using it to make garments for yourself and family. Learn how to adjust tensions, threads, cutting and much more. 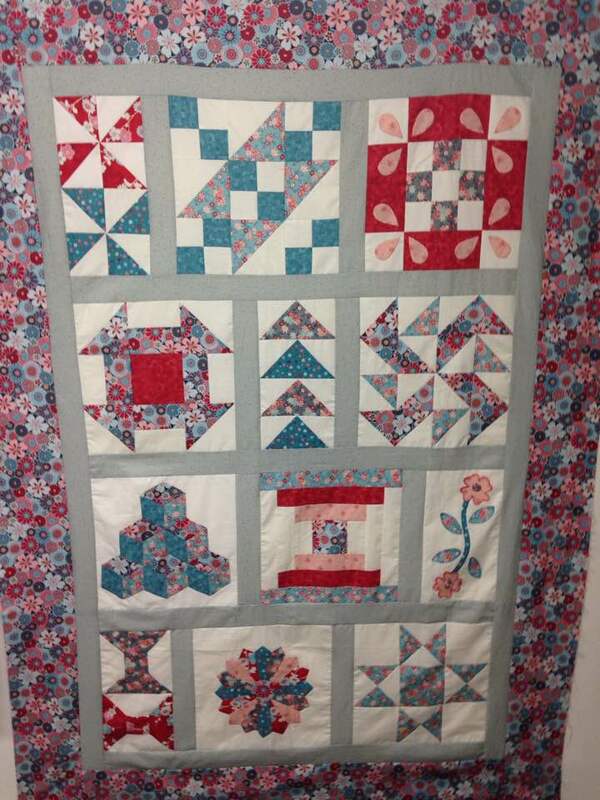 Ann has helped such a lot of people achieve their dream of making a quilt. Believe it or not this is a beginners quilt. Each week you will learn a different block and at the end of the course how to put the quilt together and then how to quilt it. Tumbling blocks, dresden plate, honey bee these are the names of some of the blocks you will be learning. A 10 week course starting on Tuesday 20th September ending on Tuesday 22nd November. 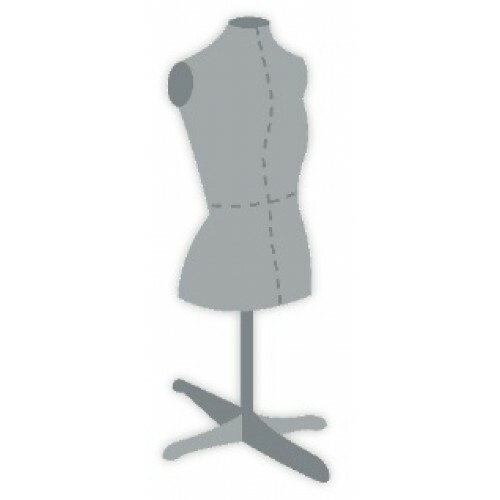 This workshop is designed for beginners. Dressmaking is such a satisfying hobby, wearing a garment you have made yourself is the ultimate in designer wear. 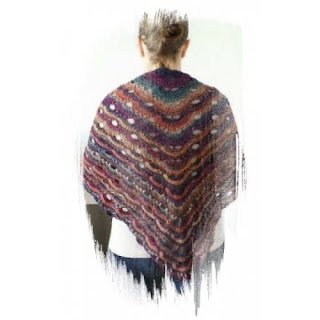 Beccy will teach you how to read a pattern, explain the markings, simple adjusting and so much more. You may choose your own pattern, but, please choose something simple! If you are not sure have chat with Beccy before booking on the course. 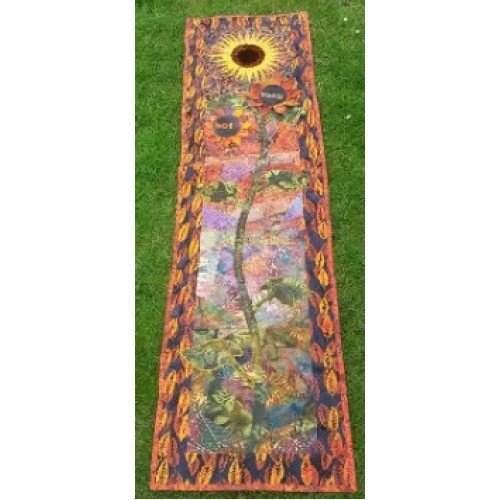 With Lisa's wonderful use of colour, this rich and mysterious machine and hand embroidered picture will grace any wall. 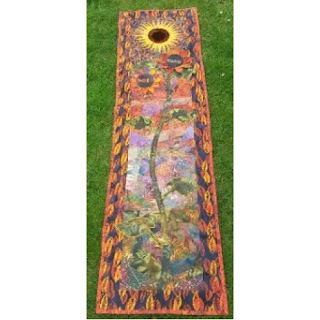 You will learn to appreciate how to use fabric and threads as your art making medium, learning all the skills necessary to complete this wonderful picture,learning all the basic skills required to maybe design your own piece of art work. This year Gaelle has designed a beautiful crocheted shawl, this is not a class for the beginner but for those who like to take their skills a little further. A great workshop for those cooler evenings and a superb present for Christmas. Not many places for this workshop so book early to avoid disappointment.